Imagine this scenario: A government contractor is overcharging your state government agency for goods and services. You know this because you once worked in the billing department of the contractor. You report this to your supervisor who terminates you shortly afterward. So, you file a complaint with the Florida Commission on Human Relations (FCHR), which reinstates you to your position. Your former employer takes the matter to court under Florida’s whistle-blowing law and has you removed again. The court overturns the FCHR’s decision because the whistle-blower law requires a complainant to file within 60 days of the alleged incident and you filed more than 100 days later. Also, the FCHR didn’t have jurisdiction to hear your case. Once again, you’re out of a job. My sample of state-level cases shows that outcomes such as this aren’t unusual in whistle-blower cases filed in American states. Would-be whistle-blowers might wonder if it’s worth it, yet many continue to report wrongdoing. Most recently, Amy Stoupe, CFE, the 2010 ACFE Sentinel Award recipient, blew the whistle. Others who did the right thing include Cynthia Cooper, CFE; Sherron Watkins; Pamela Meyer Davis; Bunny Greenhouse; Marta Andreasen; Dr. David J. Graham; and William Sanjour. Of course, all paid a high price to come forward. As CFEs, we might find it necessary to report wrongdoing, but we should proceed with caution before blowing the whistle. My review of state-level lawsuits suggests that being entitled to protection under a state whistle-blower statute and receiving that protection can be two different matters. All the U.S. states have laws to protect public employees from retaliation. Most of the state whistle-blowing laws were enacted to encourage public employees to report fraud, waste, and abuse in government agencies. Some laws protect only public employees; others include government contractors and private-sector employees. Most of the states also have laws covering private-sector employees. However, many of these laws protect reports involving workplace safety. They were enacted decades ago to protect employees from retaliation when reporting occupational safety issues. Public and private employees can use them, but they might not apply to all situations. Over the years, reporting in other specific situations has been protected. Many states enacted anti-retaliation clauses for specific claims or industries. For example, Rhode Island has anti-retaliation clauses in statutes pertaining to gaming, nursing homes, health-care facilities, nonprofit hospitals, insurance fraud, health maintenance organizations; and asbestos abatement. Anti-retaliation clauses are designed to protect public and private employees working in specific cases. Whistle-blowing, as it relates to fraud, is the act of reporting fraud, waste, and abuse. Reporting any act of wrongdoing is considered whistle-blowing, regardless if it’s reported by a public or private employee or to persons inside or outside of the victim organization. Take the Texas Whistle-blower Act, for example. It protects public employees from retaliation who report violations of law to appropriate law enforcement agencies, providing the employee files a grievance within 90 days of when the employer’s adverse employment action occurred or was discovered by the employee. The employee must initiate action under the grievance or appeal process of the governmental employer before filing a lawsuit. The employee must also report the violation in good faith, prove the retaliation is the result of the whistle-blowing, and identify the laws violated and the persons engaged in the violations. Employees can be compensated for their losses, but the entity can defend itself by asserting its actions were unrelated to the whistle-blowing. This is an affirmative defense that can be asserted by any employer. Employers using an affirmative defense will admit they took the adverse personnel action but claim the action was due to events independent of the whistle-blowing. If you find Texas’ Whistle-blowing Law daunting, you’re probably not alone. My review of state-level lawsuits filed by whistle-blowers shows that it’s difficult to receive protection under many of the state laws. I selected a random sample of lawsuits from the statewide cases reported in the LexisNexis database between 1994 and 2009. I keyed in the search term “whistle-blower” and found 380 cases involving whistle-blowers who sued their employers for alleged retaliation following the reporting of a wrongful act. I stratified the lawsuits chronologically by state and selected every fourth case to obtain a random sample of 95 cases. I conducted a content analysis of each case to identify: 1) the type of retaliation taken against the whistle-blower 2) the type of wrongdoing reported 3) the public policy issued 4) the outcome for the whistle-blower 5) the reason the whistle-blower won/lost the lawsuit 6) whether the whistle-blower was a public servant 7) the law used to file the case. Seventy-four percent of the whistle-blowers in my review were terminated. Another 6 percent were suspended and 5 percent were transferred against their wishes. The remaining 15 percent were given poor evaluations, demoted or harassed. The results, summarized in Exhibit 1 (below), indicate that retaliation occurs, although this review can’t determine how often. Approximately 60 percent of the lawsuits were filed in the past 10 years; however, it’s impossible to say why employees are increasingly turning to the courts to solve their problems. Perhaps employees are reporting wrongful acts more frequently and filing more frivolous lawsuits. It’s also possible that employers are committing more acts of wrongdoing and retaliating more often. Then again, it’s possible the rise is due to the increasingly litigious nature of American society. The whistle-blowers in this sample didn’t fare well in their lawsuits. Fifty-five percent lost their cases. Fourteen percent lost because they failed to prove their cases. Eleven percent failed to prove a causal connection between the alleged retaliation and the whistle-blowing. Only 22 percent won their lawsuits. Of these, 2 percent were reinstated to their old jobs and 8 percent won damage awards. The remaining 23 percent of the cases were remanded for a new trial. To prevail, employees will probably have to link their whistle-blowing to the retaliation. This can be difficult for employees having problems in the workplace because employers will claim their adverse personnel actions were based on the employees’ poor performances – not the employees’ decisions to blow the whistle. It’s especially easy for employers to assert this claim if the person who conducted the retaliation claims no knowledge of the whistle-blowing. Twenty-two percent of the whistle-blowers lost because they didn’t comply with some technicality in the laws. As discussed previously, the laws are very specific on how whistle-blowers must report the wrongdoing. Failing to comply with any aspect of the law will result in a loss of protection. Six percent of the employees lost because they failed to exhaust all their internal remedies before reporting their concerns externally. Many laws require the employee to report internally first to give the employer an opportunity to correct the matter. This minimizes the potentially devastating impact that public reports can have on organizations when the claims don’t have merit or could be handled more effectively internally. Internal reports can also allow the employer to conceal the unlawful activity, if they are so inclined. Another 5 percent lost because they failed to report the act of wrongdoing correctly. Some laws require the witness to report the wrongdoing in writing within a certain period of time after it’s discovered. Other laws require the whistle-blower to state the specific laws that were broken. The purpose of these requirements is to provide the employer with specificity so it can correct the problem. Case in point: A high-level officer, working for a government defense contractor, discovered that his employer was overbilling the government, supplying defective parts, and engaging in the unauthorized use of government equipment. He refused to participate in the activities and reported them to his employer’s government liaison officer only to find himself terminated afterward. He sued under Florida’s whistle-blower law and lost because he failed to first inform his employer of the alleged activity in writing. Five percent of the employees in the sample lost because they filed their lawsuits using inappropriate laws. Choosing an appropriate law sounds easy, but that isn’t always the case. Case in point: A flight engineer, working for a Florida-based airline and also living in the state, was terminated after he insisted on delaying a flight at New York’s John F. Kennedy Airport to repair the plane’s hydraulic system. He filed his suit in a Florida court under a New York State labor law because, at that time, Florida didn’t have a whistle-blower law. The court dismissed his complaint and the engineer appealed. In the meantime, Florida enacted a whistle-blower law and it covered private-sector employees. The case went all the way to the Florida Supreme Court, but the engineer lost because Florida’s whistle-blower law didn’t apply retroactively. Most whistle-blower laws are intended to protect public-sector employees who report violations affecting public health and safety. Proving public interest is easy for public-sector employees because their work involves public protection. It’s not as easy for private-sector employees. Eleven percent of the private-sector whistle-blowers in the sample lost their cases because the matters didn’t involve public policy. The case of two nurses working in a private nursing home exemplifies the difficulties private-sector employees can have winning in court even when their cases appear to involve public interest. Case in point: A hospital fired one of its therapists six days after he told representatives from an accrediting organization during a site visit that the hospital’s therapists completed patient charts sometime during their shifts rather than immediately after treating patients as required by the accrediting organization. The therapist, who had worked for the hospital for 23 years, sued for retaliation and lost because he couldn’t convince the courts that charting was a matter of public policy. The therapist argued that the Illinois Medical Patient’s Rights Act gives patients the right to sound and consistent care, and failing to immediately chart jeopardizes patient care. The court said it wasn’t enough to claim a broad or generalized public policy. To prevail, the therapist needed to show how a lack of immediate charting violates an Illinois state law, and the therapist wasn’t able to find an Illinois law that requires immediate charting. Only the courts can decide whether an issue is a matter of public policy, and this court wasn’t willing to find it so. Five percent of the private-sector employees in this sample lost because they mistakenly filed charges under statutes that covered only public employees. Not all the laws protect private-sector employees. Whistle-blowers need to make sure they are covered by the laws they use. Eighty-five percent of the cases involved issues of public health, safety, or interest. Twenty-five percent involved public safety. Fifteen percent involved public health. Sixteen percent involved the misappropriation of public funds. Eighteen percent involved matters of general public interest, and 11 percent involved civil rights violations. Public employees filed 60 percent of the cases in the sample, and they tended to witness the most serious violations of public policy. Public engineers reported the most serious offenses. These incidents usually involved public exposure to toxic chemicals or waste. Public nurses also reported serious issues. Their complaints usually involved patient neglect and fatal accidents. The complaints of police officers were also very serious and usually involved internal corruption. Damage awards were often given to whistle-blowers who reported serious public policy issues. An analyst in a California public housing authority, for example, reported that someone was leaking confidential bid information. 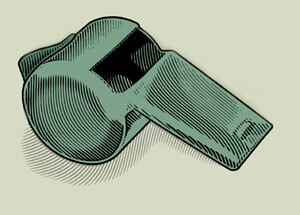 The whistle-blower was fired, but was awarded a $1.3 million damage award in court. In Pennsylvania, a housing authority employee reported self-dealing and received a $900,000 damage award for being terminated. These awards were given to whistle-blowers reporting irregularities involving public funds. Large awards were also given to whistle-blowers reporting violations of public health and safety. A Connecticut water treatment plant engineer was terminated after reporting plant managers for concealing that the town’s water supply was inadequately treated. The court awarded the engineer $127,000 for lost wages. These awards support the assertion that whistle-blowers are public employees attempting to resolve serious violations of public policy. The violations, summarized in Exhibit 2 (above), show that 15 percent of the employees accused their employers of issuing false reports. Fourteen percent alleged violations involving air or water quality. Ten percent alleged nepotism or self-dealing. Nine percent alleged patient abuse or neglect. Nine percent alleged discrimination or civil rights violations. Eight percent alleged miscellaneous violations and another eight percent alleged violations of state labor laws or workplace safety. Examining the laws whistle-blowers use to seek protection can provide insights into why they often lost their cases. 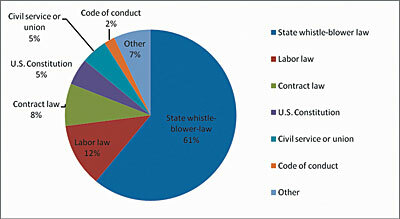 Sixty-one percent of the whistle-blowers sued using a state whistle-blower law. Twelve percent used an anti-retaliation clause in a labor law. Eight percent sued under contract law, and 5 percent sued under the U.S. Constitution or other civil rights law. Five percent began by having their cases heard in a civil service or union hearing, and 2 percent sued to appeal a professional code of conduct violation. The remaining 7 percent filed under a miscellaneous law. The laws are summarized in Exhibit 3 (below). Sixty-four percent of the whistle-blowers who sued using a labor or employment law lost, despite the fact that they barely blew the whistle. In most of these cases, the employees were terminated shortly after beginning their inquiries, but they didn’t lose for making unsubstantiated allegations. They lost because the matters in their cases weren’t of public interest. Case in point: An auditor, working for a New York City brokerage firm, reported that corporate officers were engaged in money laundering. The firm terminated him, even though the firm’s policy manual specifically prohibited retaliation against employees engaged in investigations. He filed a complaint with the New York Stock Exchange and received compensatory damages in arbitration. He then filed a lawsuit under a labor law to seek punitive damages. The auditor lost because punitive damages are awarded only when the perpetrator engages in a pattern of conduct aimed at the public in general. The whistle-blower in this case wasn’t able to prove sufficient public interest. The whistle-blowers in the sample who sued under contract law were independent contractors. They sued for breach of contract when they were terminated prior to the end of their employment contracts and lost when they failed to prove the causal link between their termination and whistle-blowing. Some of the courts allowed the employers to terminate these employees “at will” despite their employment contracts. Case in Point: The most interesting contract law case was filed by mechanics of a chemical company. They told the Occupational Safety and Health Administration (OSHA ) that their employer exposed the chemical plant shop to asbestos, and then they were terminated. The employees could have filed a claim under OSHA, the Texas whistle-blowing law, or contract law. They decided to sue for breach of contract because under contract law they only had to prove: 1) that they had an employment agreement 2) the employer interfered with that agreement and 3) the employer’s interference resulted in damages. The mechanics proved their case and were awarded compensatory damages for lost wages. It wasn’t clear from the case, but it’s likely they also were reinstated to their positions. Some of the whistle-blowers sued to protect their rights to free speech under the First Amendment of the U.S. Constitution. These employees claimed the employer’s retaliation was a violation of their right to free speech. To prevail, these whistle-blowers had to prove the issue was a matter of public interest. That wasn’t always easy. A Utah firefighter, for example, claimed that his department’s new protocol for handling wildfires was unsafe. The court looked to whether the employer’s interest in promoting efficiency outweighed the employee’s right to voice public concerns and decided that the manner in which the firefighter voiced his concerns undermined efficiency and morale. The firefighter had secretly tape-recorded conversations with co-workers and jumped the chain of command. The court held that the firefighter had carried his concerns to protect the public too far. In another First Amendment case, a Nebraska prison guard told a reporter about the serious racial problems in his prison. The guard was terminated, despite the fact that he had permission to participate in the interview. Prison officials claimed the guard overstepped his authority to speak in the interview and that his speech disrupted prison efficiency. The court held that racial problems are a matter of public interest and outweigh any harmful effects to prison efficiency or morale. The guard was reinstated and awarded attorney’s fees. Most of the whistle-blowers who began their complaints with civil service or union hearings were police officers, alleging harassment after reporting internal corruption. The officers lost at hearing and sued to appeal those decisions. Most of the officers were assigned to task forces charged with investigating internal corruption. They were harassed when the investigations led to findings of internal corruption. All but one lost on appeal because a higher court won’t overturn a lower court’s decision unless it’s arbitrary and capricious. The only officer to prevail demonstrated a long pattern of harassment, which led to his complete mental and physical breakdown. Although the officers usually lost pursuing this course of action, as civil servants they likely were required to begin with civil service or union grievances. Most of the employees who sued to appeal decisions that their whistle-blowing violated professional codes of conduct lost when the codes required the professionals to maintain client confidentiality. The whistle-blowers argued that employers aren’t clients, and the codes don’t require employee-employer confidentiality. The courts still held these employees to a higher standard of confidentiality. So far, the courts have applied this standard to attorneys, but other professionals with confidentiality clauses in their codes of conduct, such as accountants, could be held to this standard as well. Most of the whistle-blowers in the review lost their lawsuits. Exhibit 4 (above) shows that 55 percent of the whistle-blowers filing under a state whistle-blower statute lost their cases. Sixty-four percent filing under a labor law lost, as did 60 percent of those filing under the U.S. Constitution or civil service agreement. Half of the employees appealing a violation of a professional code of conduct lost. This review couldn’t determine why the whistle-blowers used the wrong laws or filed in inappropriate courts. It’s clear that many of the whistle-blowers could have been more successful if they had been smarter about what and where to file. Several factors play a role in deciding under what law and in which court to file. These are issues of jurisdiction and venue and are discussed in “Deciding Where to File” below. Whistle-blowers can improve their chances of success by preparing early and reading the whistle-blowing laws. The case law is also important because it shows the precedent already set by the courts. The better prepared you are, the less likely you’ll make avoidable mistakes. Case in point: One whistle-blower made a fatal mistake when he filed charges against the individuals who committed the wrongdoing rather than his employer. Had he researched the law, he would have known that the term “employers,” as used in the Massachusetts’ law that reads “an employer shall not take retaliatory action against an employe ...” means the commonwealth and its agencies or political subdivision. Therefore, under the law, the allegations had to be lodged against the employer, rather than the individual offenders. Unfortunately, he filed against the offending employees and lost his case. Another whistle-blower lost because he filed claims in two venues only to learn later that seeking protection under one statute precluded protection under another statute. This whistle-blower filed a claim alleging retaliatory discharge under the Minnesota Whistle-blower Act and a claim of reprisal discrimination under the Minnesota Human Rights Act (MHRA). The whistle-blower presented the claims in court and received favorable decisions on both claims. The employer appealed and the Supreme Court decided that the exclusivity clause in the MHRA barred the filing of any other claims on the matter. An Ohio guidance counselor lost because she failed to prove that she suffered damages from the retaliation. The Ohio law states that a claim of retaliation can be brought only where the employee suffers a direct monetary loss. The Ohio whistle-blower didn’t suffer a financial loss because every time the school district assigned her to a distant work location, she complained and was reassigned closer to home. DON’T GET CAUGHT WITH UNCLEAN HANDS! Five percent of the whistle-blowers failed to receive protection because of their improper conduct. Some of these whistle-blowers misused their employers’ property; some of them stole it. Employees must ensure their conduct is above scrutiny because some courts will apply the “doctrine of unclean hands” and bar whistle-blowers from protection, if they’ve engaged in misconduct directly related to their complaints. Case in point: A California quality assurance manager secretly copied confidential patient records to prove that a near-fatal incident was caused by human error after her hospital-employer appeared to be dodging an investigation. The manager pursued an investigation and was fired a few weeks later. The manager sued for wrongful termination and barely prevailed. The lower court applied the doctrine of unclean hands and ruled in favor of the hospital. The manager appealed. The appeals court didn’t dismiss the case but significantly limited what the employee could recover because of her unclean hands. The doctrine of unclean hands can work against employers, just as it does employees. In 2001, a Florida health-care agency submitted documents containing incorrect information to the court. The whistle-blower proved the information was false and won her case on those grounds alone. Thus, it’s important for employers and employees to comport themselves with integrity. Whistle-blowers who commit unlawful acts to advance their cases don’t do well in court, but neither do whistle-blowers who refuse to commit unlawful acts on behalf of their employers. Most state whistle-blower laws are designed to protect employees that refuse to commit unlawful acts, but it can be difficult to receive that protection. Case in point: A Texas deckhand was asked to pump the bilges of the boat into the water, despite a placard on the boat, which stated that pumping bilges into the water was illegal. The deckhand confirmed with the U.S. Coast Guard that the practice was illegal. The deckhand refused to pump the bilges and was fired. He sued for wrongful discharge and prevailed because the court upheld the public policy doctrine that prevents the termination of at-will employees for refusing to perform illegal acts. The deckhand above prevailed, but many others haven’t been as fortunate. A Florida tugboat captain, for example, was fired after he refused to make an 18-hour trip in contravention to the federal safety regulations. The captain lost in court, even though the Florida whistle-blower law states that employers can’t retaliate against employees for refusing to participate in unlawful activities. Employees such as the tugboat captain might manage to avoid breaking the law, but they may have to sacrifice their jobs to do so. The review of this sample of cases helps provide some important insights into actual whistle-blowing incidents. The review shows that even when well-intentioned employees feel they’re doing the right thing by reporting acts of wrongdoing, their reports aren’t always well received. The findings also suggest that employees who witness acts of wrongdoing should seek legal counsel before acting. The cases didn’t involve any whistle-blowers who also happened to be CFEs, but CFEs might run into the same types of problems. CFEs should learn when, where, and how to report fraudulent acts before they blow the whistle, so they can comply with the procedures required to receive protection. This review looked at only a sample of the state-level cases filed against employers for retaliation. But it does highlight the fact that whistle-blower cases can be difficult to prove, and it’s best that all involved (including CFEs) should be knowledgeable about the laws involved and seek legal guidance early. Patricia A. Patrick, PhD, CFE, CPA, CGFM, is associate professor of accounting at the Shippensburg University of Pennsylvania, where she teaches auditing and forensic accounting. She’s a recipient of the ACFE’s 2000 Walker Award for attaining the second highest score on the CFE Examination that year. • Subject Matter Jurisdiction – Courts must have power to hear the kind of issue in your suit. Subject matter jurisdiction is based on the law you plan to use. Generally speaking, federal courts hear violations of federal laws and state courts hear violations of state laws, although this isn’t always the case. Employees can file alleged violations of their civil rights in state or federal courts under Section 1983 of Title 42 of the U.S. Code of Federal Regulations. While rarely used in the past, today Section 1983 is part of the Civil Rights Act and the primary means of enforcing all Constitutional rights. Subject Matter Jurisdiction can help employees decide to file in federal or state court. Of course, the employer might ask to have the case moved to another court. • Personal Jurisdiction – Make sure the court has power over the party you want to sue. A court must have personal jurisdiction over the defendant to hear a case. Courts usually have personal jurisdiction over the people and organizations residing or doing business in their jurisdiction. • Venue – Venue refers to the court that will hear your case. The proper venue is the jurisdiction in which the defendant lives or does business, the contract was signed or carried out, or the incident took place. More than one court can have jurisdiction over your case. Pick the venue most convenient for you. An Ohio prosecutor gathered payroll records that he believed proved his co-workers were overstating their wages. The attorney reported the allegations to the local police department and was subsequently fired. When the case went to trial, the attorney was denied whistle-blower protection because he failed to investigate his suspicions. The court said that had he made reasonable internal inquiries before reporting his suspicions externally, he would have learned that his co-workers weren’t committing payroll fraud and he wouldn’t have reported externally. The prosecutor was denied protection under Ohio’s whistle-blower law because the law specifically states that employees must make good faith efforts to determine the accuracy of the information they are reporting, and a failure to make such an effort could lead to disciplinary action, including termination. A scientist in charge of environmental health for a large U.S. oil refinery in New Jersey learned his employer was supplying Japan with gasoline containing dangerously high levels of benzene, a carcinogen in gasoline. He told some Japanese managers about this at an industry conference in Japan. The Japanese managers said they couldn’t reduce the benzene because it was too expensive. The scientist knew that Japan didn’t require warning labels, use vapor containment systems, or catalytic converters. He also knew that New Jersey’s state laws and international treaties prohibited the marketing of gasoline with unsafe levels of benzene. The scientist advised the Japanese managers to stop using the gasoline until it could reduce the benzene. When the scientist returned from Japan, he was immediately restricted from his employer’s premises and given an “indefinite special assignment.” Two weeks later, he was terminated. The scientist sued under New Jersey’s Conscientious Employee Protection Act and was awarded $2.5 million in compensatory damages, $875,000 for emotional distress, and $3.5 million in punitive damages, despite his employer’s alleged unawareness of the scientist’s comments at the conference. The ACFE Foundation has awarded 30 college and university students with the Ritchie-Jennings Memorial Scholarship worth $1,000 each for the 2010-2011 school year. Excellent article, very useful. Two questions follow: 1. Does the author have an opinion as to why retaliation against whistleblowers is so common? Does it reflect a general deficiency in ethical values, complicity in the crime, fear of encouraging more whistleblowing, something else? 2. Does any State have a model whistle blower protection statute, particlularly for State government employees?